This weekend was to create a glitter card. Mine probably could have been a little more bedazzled, however, I REALLY wanted to showcase this adorable new stamp set and die set!!! How about these Flower Pot stamps? Aren't they the sweetest? I didn't have the matching dies so I fussy cut mine!!! I mounted the pots onto the Window with Shutter Die adding some acetate behind the frames to make them more realistic. 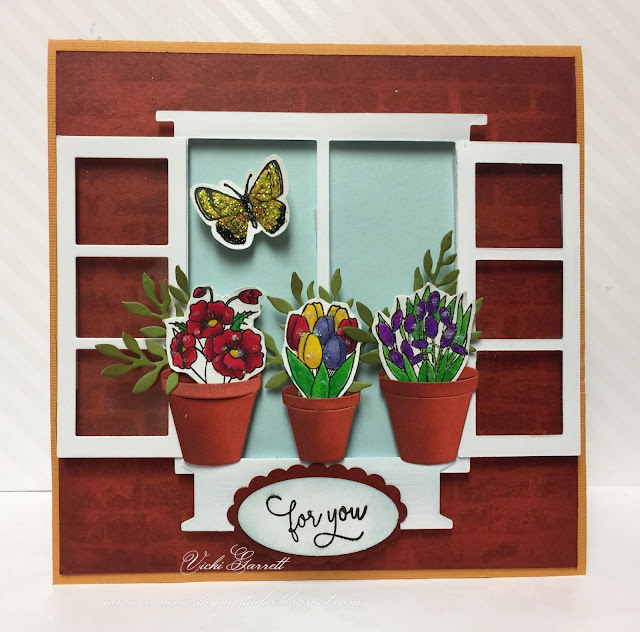 The Sentiment is also from the Flower Pot Stamp set. I added the bits and bobs of glitter to make it eligible for today's challenge!!! I hope you enjoyed looking as much I enjoyed creating the card for you!!!!! Be sure to check out the other DT creations and link your own up on the IO blog for a chance to win a great prize!! !